This was the cute collage that was posted on Silly Bee’s Chickadee’s Facebook page when she was ‘announced’- everything on there is from her ‘interview’ about her favorite things. 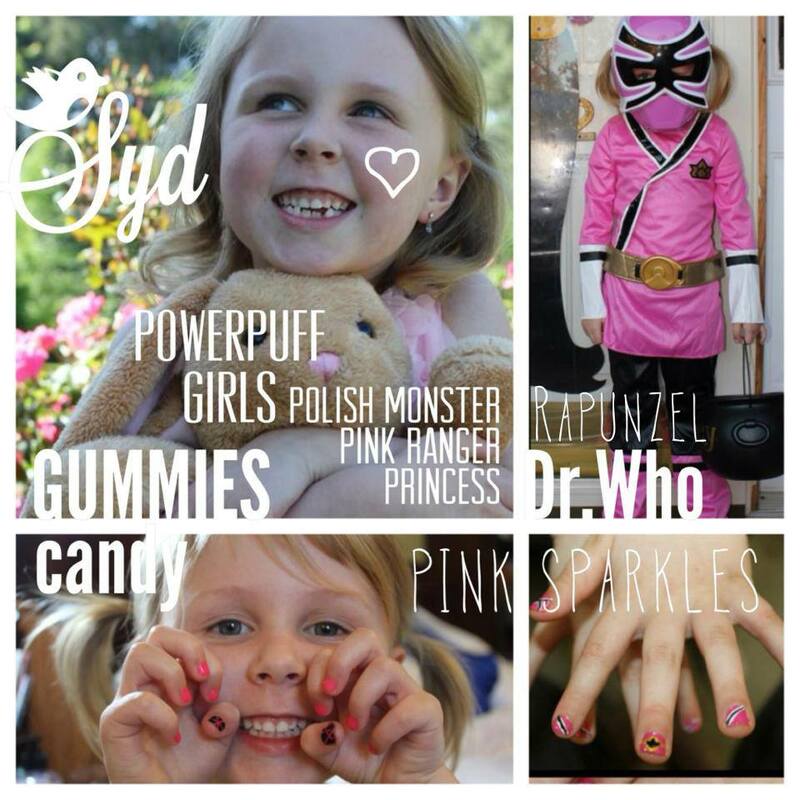 Yes, Dr. Who is actually one of her favorite things- her favorite is 11, and Amy Pond. She’s pretty crushed he won’t be around much longer. She even has her own talking Dalek she plays with. Melissa was sweet enough to send out 2 mini polishes addressed specifically to her, all wrapped up in pink paper and bubble wrap. She felt like quite the princess! I let Syd paint her own nails, and then I went behind her and cleaned up with my normal polish remover/concealer brush. We didn’t do any prep work/cleanup beforehand on her nails- the only thing she does use semi-regularly is her own container of Sunny’s Hand Cream (she chose Strawberry Buttercream- which is a scent I don’t like, so she never has to worry about me touching hers). It’s the only lotion/cream we were able to find last winter that helped the severely dry, cracking skin on her hands. I’ve said it before, but I highly recommend it! 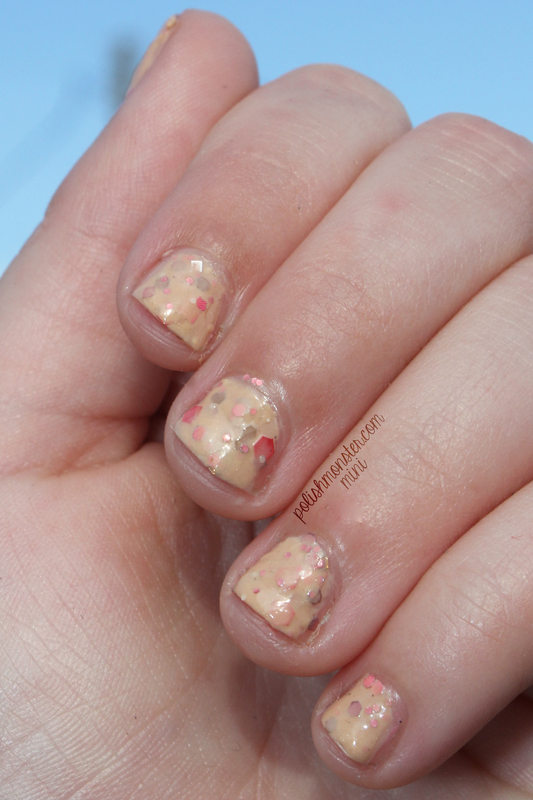 First, we swatched Silly Bee’s Chickadee’s Raspberry Sorbet. Pictures are 2 coats with no topcoat (she didn’t want to use the ‘shiny polish’). This was Syd’s favorite- because it’s pink. Could you guess from the picture above that her favorite color is pink? 🙂 I asked her what her favorite part of this polish was, and she said ‘It’s pink and sparkly’. Then I asked what it reminded her of- she said ‘bubble gum’. Melissa also sent Everything Nice- another pink themed polish! I think Syd had a little trouble putting this polish because it had more glitter, but she got the hang of it. Her favorite part- surprise surprise- was the ‘big pink glitters and birdie (label) because it’s so cuteeeee’. When I asked her what this polish reminded her of, her answer was ‘a sprinkle cookie like we get from the store (Publix)’. So there you have it, my kiddo’s blogging debut. This won’t be a recurring thing, though I may post more of her photos in a Facebook album specifically for her pictures. She’s definitely had a lot of fun doing this- thank you so much Silly Bee’s Chickadees!